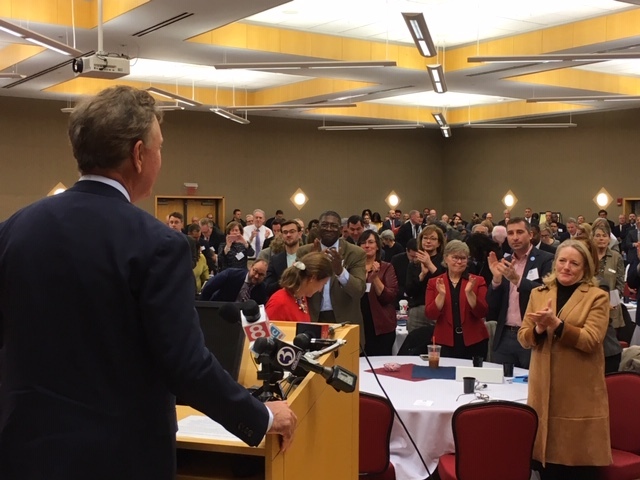 Gov.-elect Ned Lamont addresses the crowd at his policy summit Tuesday. Willimantic — The transition team of Gov.-elect Ned Lamont opened a free-wheeling, if slightly chaotic, series of policy discussions Tuesday that drew more than 450 people to a day of brainstorming and networking at Eastern Connecticut State University. “This is a fresh start that none of us are going to squander,” Lamont said. And he wants them by mid-December. What Lamont termed “a policy summit” comes as his administration is working to make its first key appointments. Lamont hinted Tuesday that he has settled on a chief of staff, who people familiar with the transition say is most likely to be his transition director, Ryan Drajewicz. Lamont said he has not chosen a secretary of policy and management, whose portfolio is dominated by the make-or-break task of every administration — crafting a balanced budget in a state with structural deficits. Economic growth is a top priority, but Lamont hopes to escape a budget debate that excludes all else. “I don’t want the next six months to be defined by a budget. I want it to be defined by what we can do as a state, where we go, how we make the state go forward,” Lamont said. Lamont got an early taste of how little control, at times, a governor can have over his day when news of United Technologies Corporation’s announcement that it would split into three units competed with the policy summit for Lamont’s attention. A phone conversation with Gregory Hayes, the UTC chairman and chief executive, suddenly was added to the schedule. UTC is spinning off Otis and Carrier and will focus on its expanded aerospace business, which includes its Connecticut-based jet engine manufacturer, Pratt & Whitney. The attendees at Tuesday’s summit were a diverse mix of labor, business and other interests on opposite sides of many policy issues, including complex ones like energy and healthcare. Republicans invited by the Democratic governor-elect included Stonington First Selectman Rob Simmons, the former congressman. Simmons is serving on a committee lead by former House Speaker J. Brendan Sharkey and and United Way leader Rick Porth, looking at ways municipalities can share services. Stonington is part of regional health, water and police dispatching services. “These small towns can no longer survive by providing all of the services in house. It just doesn’t work any more,” Simmons said. First Lady Cathy Malloy led a discussion on criminal justice reform, a topic that was a priority for her husband, Gov. Dannel P. Malloy. She called the summit a good start, a way to connect people of varying backgrounds on complex issues. Mindful of Lamont’s call for “actionable issues,” the criminal-justice group talked about a relatively mundane chore that is an obstacle for former offenders to get jobs after leaving prison — obtaining a driver’s license. “Dealing with racism and poverty and disparity in education all are harder to deal with than a license,” Malloy said. Many of the committees are dealing with policy areas that pose a wide and complex range of challenges for the new administration, she said. Among the 15 committees is one solely relegated to women’s issues. In his introductory remarks, Lamont drew some annoyed looks when he said, “I’m not quite sure what women means.” But he said was serious about talking about issues like paid family and medical leave, which are not exclusively women’s issues. Caitlin Clark Pereira, a member of the women’s panel, praised Lamont for including a panel to examine women’s issues, even if he briefly struggled to think what those issues are. “That’s why the women’s policy committee is so critical,” she said. Jennifer Jackson, the president of the Connecticut Hospital Association, which frequently clashed with the Malloy administration over funding issues, co-chairs the policy group on healthcare. A Malloy critic on the budget, Mike Handler, is on the jobs-economy policy committee. “It’s early, a good start,” said Handler, the chief financial services officer of Stamford and a former GOP candidate for governor. He did not mind that the day was little chaotic.